Since the emergence of games like Gears of War and Halo, space marines have become all the rage in video gaming. Given about as much personality as a block of wood and armour which clearly compensates for a lack of something down below, the space marine concept has become somewhat dry lately due to over-exposure. But now, Relic is delivering a game based around the entire concept of such characters, situated in the Warhammer universe. Does it make blowing up anything standing in your way fun, or is it just another one of those 'space marine' games? You play as Titus, leader of a squadron of Space Marines. Orcs have invaded a Forge World and it’s up to you and your group to clear these enemies out. The story is not all very interesting. Cut-scenes frequently punctuate the action, meaning the story certainly doesn’t fade into the background of the game, but due to bland voice acting and repetitive voiceovers (literally, the grunts in the marines have the same voice-over as the grunts in the Orcs!) it certainly isn’t engaging. Twists are abound, but they come as somewhat unsurprising because it’s stuff which you’re expecting to happen. And the unsatisfying ending will leave a cold taste in your mouth, essentially calling you the bad guy for the events which just transpired. The game is divided into two sections – campaign and online multiplayer. The campaign is pretty basic, divided into five acts which contain multiple chapters each. Levels are completely linear, and if you don’t follow the right direction an icon on-screen will inform you of which way you should be going. The strict linearity means you really can experience all the campaign has to offer on your first playthrough, and its deadly short clocking in at about 6 hours of length. The only reason to replay the campaign is to either find collectables you may have missed on your first run or mop up any achievements you may have missed. But overall, its strict path means that there’s little room for replay value in the campaign. Space Marine is a third-person shooter combined with a melee combat game. Titus carries up to four firearms and a melee weapon. It might sound odd, but Relic has made sure the game is smooth despite smashing two different kinds of game together. All the melee actions are mapped to the Face buttons, while shooting and aiming are mapped to the triggers and bumpers on top. It works very well, and makes sure it doesn’t suffer from the Gears of War-syndrome by cutting out any cover kind of cover-system mechanic. Titus also has a rage mode, where after doing enough damage to enemies and the meter is filled, players can click both analogue sticks to activate. This puts Titus into a mode where melee attacks to more damage, and if you aim with your weapon time slows down and bullets do more damage. It’s definitely useful in the tighter and more difficult situations. Weapons are satisfying, whether melee or firearms. A semi-large variety of firearms can be picked up throughout the game, including standard pistols, sub-machine guns and sniper rifles, as well as plasma versions of these weapons. There are hundreds of enemies to kill, so Relic smartly enabled infinite-ammo for pistols so you don’t come up unarmed in a fight. But, melee weapons also ensure this. You can find around 3 variations of melee weapons throughout the campaign – a chainsaw-style sword, a power axe and later in the campaign a giant Thor-style Hammer. The weapons pack a satisfying punch in Space Marine, meaning combat usually isn’t too boring. And Relic compliments these weapons by giving the player huge amounts of enemies to kill. Some fights have dozens of orcs running towards you and ready to kill you, and it’s up to you whether you take them down with melee assaults or firearms. To avoid boredom, different enemy types are thrown into the mix, requiring somewhat differing tactics for success. You have standard orcs, which come in tiny and middle-sized forms that you can deal with in any kind of manner so to speak. Then you have the other, tricky kinds – the larger enemies, rather than brute force, require successful stun combos to weaken. Other enemies are sat in long-range distance with mortar-style explosives, requiring sniper rifles or long ranged weaponry. It’s definitely fun killing enemies in huge battlefields, where one blow can knock down dozens of enemies at once, but really this is all you do for the entire game, with no kind of variety for good measure, meaning it becomes a bore towards the end. Relic tries to shake things up at a couple of points. Two boss-fights are added in for good measure, but one requires you simply to do what you did before – hack away until they play dead – and the other is more of a fight against waves of enemies until you enter an action sequence with quick-time events. The game also shakes up its enemy types about three-quarters of the way through, with a new race of enemy making their first appearance due to troublesome circumstances. But, it just boils down to hacking at your enemies until they are dead. Online, however, may salvage the player’s enjoyment in this game. The game enforces a code from new copies of the game or purchasable access to the game’s multiplayer component past Level 5. Though some may be annoyed with this feature, where essentially Relic will be asking owners of used copies of the game to pay for online multiplayer, it’s still an enjoyable experience compared to its bland single-player component. The game injects a ranking-based system where kills and other actions in multiplayer level-up your rank. Once you break Level 4, you can fully customise your character and their class. 3 classes are present, from the machine-gun heavy grunt class to a class which packs you with a laser-sword and jet pack, making for insane fun online. You can partake in multiple modes from standard deathmatch to capture the zone, and a co-op mode is also presented similar to Horde from GoW (though it requires downloading to play). The game still has a healthy community, as I was able to find a full game within a couple of minutes. 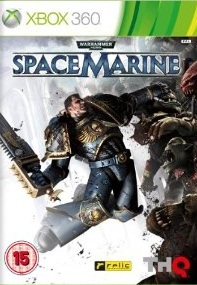 Aesthetically, Space Marine is somewhat displeasing. Graphically, the game looks a little bit low-resolution. Character models for less-important people look blocky to a degree, though animation in cut-scenes is usually good. Levels feel bland, with dark purple tints highlighting the battlefield and barren trenches populating the zones. Orc models look good, and the nasty effects from nailing headshots and melee executions are satisfying. Space Marine is a rather gory game, and the blood effects definitely add to the action. But Space Marine overall looks pretty bland. Sound is worse, however. The blimey-British accents most of these enemies contain is strange to say the least, and as mentioned before, multiple enemy/friendly types contain the exact same voice-actor. It’s also rather annoying that almost every single enemy yells at you "SPACE MARINE! ", as if the game’s title didn’t give that away. The music is sparse and generic too, adding almost nothing to the action. So Space Marine is, essentially, bland. The campaign is lacklustre, losing its fun a little bit over half-way through. The game’s presentation, with dire sound and dull graphics, doesn’t help either. It has fun weaponry, but you can only kill so many thousands of Orcs before it becomes repetitive. And because it is so strict and linear, there’s no reason to return once you’ve pulled your way through the first time. The multiplayer component is pretty fun however, with a good customisation system and a ranking system which will addict you, aping multiplayer components such as Gears of War and Call of Duty. But, considering so many games can offer you exciting campaigns as well as tight multiplayer experiences, that hardly means you should rush out and buy Space Marine. If you’re looking for a cheap game which could peak your competitive interest, Space Marine may be for you but otherwise, steer clear of this bland shooter slasher. "It has fun weaponry, but you can only kill so many thousands of Orcs before it becomes repetitive. And because it is so strict and linear, there’s no reason to return once you’ve pulled your way through the first time"